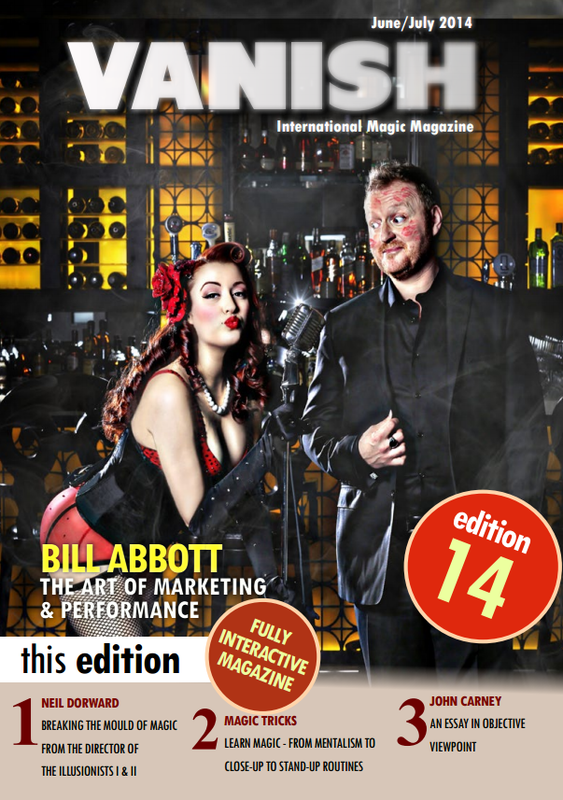 Edition 14 – Cover story this issue is Bill Abbott who opens up about the art of marketing and performing. Bill has done something very few have achieved in magic before and shares how he has done it. There is also an article that every magician needs to read by The Illusionist director Neil Dorward on what he sees magic needs to take it in to the future. Also included are contributions by John Carney, Keith Fields, Bizzaro, Alan Hudson, David Gabbay, Timothy Hyde, Nick Lewin, Matthew Fallon, Steve Spill, Craig. P. Browning, Tobias Beckwith, Peter Turner, David Berglas, Charles Bach, Ted Outerbridge, Peter Mennie, Tony Chris, Leif David, Nickle VanWormer, Diamond Jim Tyler, Danny Archer, Louie Foxx, Maximilian Draco, Wayne Rogers. Articles range from business to theory to kids magic, mentalism and illusion. ← Giveaway: 3 ebook di Claudio Facilla Shop!